Choose. It's up to you. AoV2-063 / G(II)627 / GC873 Love is patient love is kind / In Love We Choose to Live (Cotter) Gentle words based directly on 1 Corinthians 13. It might be nice to sing just the chorus with this Sirach reading. *SFFS 2129 / HPP322 / W&R344 / Cha344 / Srce2-244 / MP272 I Have Decided to Follow Jesus (Singh) Good simple traditional chorus. Do you know the story behind it? I didn't. Read it here. This Australian video from Perth has some nice chords, but you might like to sing it in its original language. Oldy-but-a-goody. ATFG563 / NCYC'03 / The Red Book How long must we cry out? (Mann) This is a big Brunswick favourite, great for young people in particular. BUC liturgists please note that we have not sung this since 2010! "Teach me to do what is right, walk in the darkness, trust in the light and may love be the path I walk upon". Good for teenagers. NOTE: This theme will continue next week, so it's a good time to choose a song you can repeat! Iona (We walk his way) / G(3)517 / StF775 We walk his way / Ewe Thina A joyful, simple African song. I'm guessing it's from South Africa. Sound sample. *Iona (WWHW) / MV223 We will go with God / Sizohamba naye (Traditional Swaziland) A simple song from Swaziland. Good for the end of the service. Video with pronunciation and parts. Note that MV has a different translation. Good for kids. NCH Psalter p701 (at the back of NCH) has a very good arrangement of Psalm 119 by Elaine Kirkland. 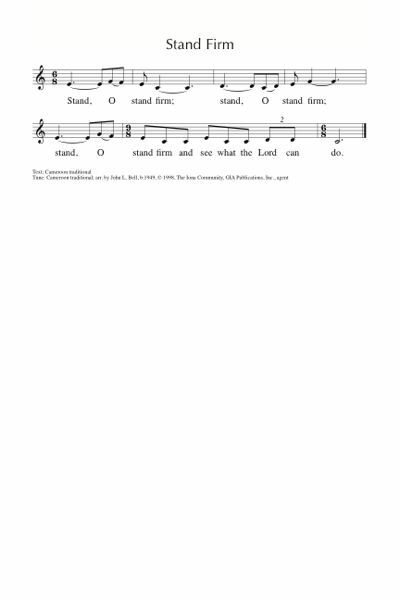 The refrain is “Teach me, O God, the way of your statutes” and can be sung in 4 parts. Note that there are three sections. This week's reading is on p701. *URW143 The Grace of God is like a road (Hudson) Really beautiful words sung to a very familiar Celtic hymn tune (THE GIFT OF LOVE, which is very similar to O WALY WALY). Highly recommended. I would even print these words for the congregation to take home with them and meditate with during the week. A good song to sing after the sermon. We sang this once, three years ago when we read this passage. Would be good to sing it again. Lyrics. New words to old tunes. 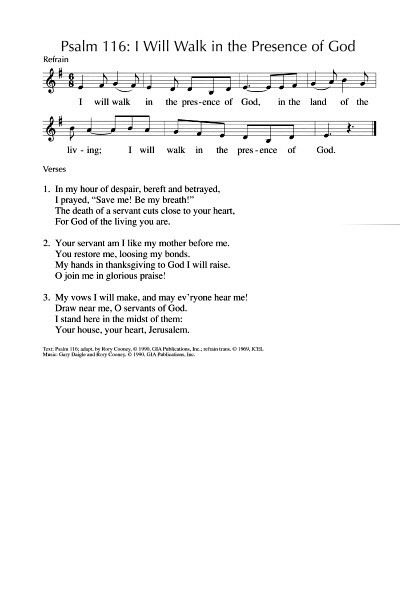 PfAS119G / PfAS199H O Lord my delight (Hopson) Simple psalm refrain for verses 1-8. *MV108 I know your word (Tua Palavra) A simple Brazilian rhythm and a catchy tune. Great for kids, and a good song for adults too. “I know your word, your word is a lamp to my feet O God. I know your word is a lamp, O God, to light my path forever”. Good for kids. *ATW 498 / Iona (T1AU) / MV 196 / SP&P182 / URW438 We will take what you offer. An excellent simple short song that works well either as an upbeat chorus or as a reflective chant. "We will take what you offer. We will live by your word. We will love one another. And be fed by you Lord". Good for kids. Sound sample. *Linnea Good / MV008 And on this path (Good) An energetic gospel style song. Here's a youtube video. We sing it much slower than this and as a gospel style song with big chords and a groovy bass part. I thought I'd never say that we sing something slower than anyone! 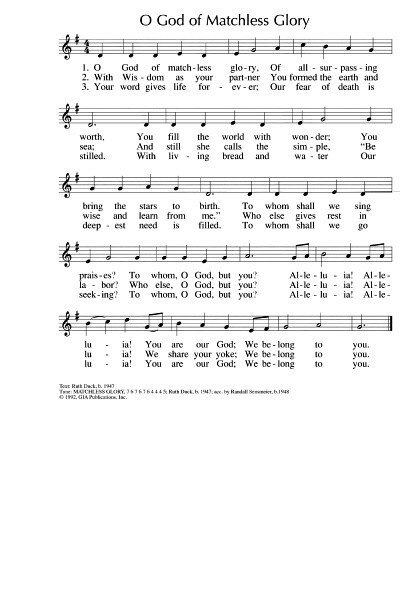 TiS 71 / VU617 / HPSS362 / G(II)97 / GC108 I will walk in the presence of the Lord (Proulx) A beautiful cantored Psalm. The refrain is very simple. Doesn’t make sense without the cantor. *MV154 Deep in our hearts (Oldham) A good song about having a common vision and purpose. Easy to sing to a lovely flowing 6/8 tune. Would work well after the sermon. Sound sample, sheet music and lyrics. I think of it a little quicker than this, but this is the composer playing, so this is clearly his intention! SFFS 2175 / GtG767 Together We Serve (Damon) Good hymn about service, sung to a very straightforward tune. Lyrics and sheet music sample. Slow sound sample. FFS80 / SFFS 2177 Wounded world (Murray) A good song for healing of the world's pain and a call to service. Can be sung to a couple of tunes. I like the Hal Hopson tune used in SFFS. Sins of the heart and head; importance of reconciliation; let your word be enough; good solid advice. *CH721 / URW156 / StF718 We lay our broken world (Briggs) Beautiful words seeking global healing. I prefer the tune in CH. Depending on your congregation, you may like to sing it to TERRA BEATA (Thanks Aaron Howe for this idea) or EVENING (Thanks Annie Strickland) or to ICH HALTE TREULICH STILL. Lyrics. Do you have some ideas too? I would love to hear them - please add in a comment below. Hello Natalie, I will be choosing TiS 552 (George Herbert: Come, my way my truth, my life) yet again this week to "introduce" the gospel. Links (poetically, ie "obscurely") the Deuteronomy "choose life" with the gospel (those things which give death); "such a life as killeth death". I know I use it quite a lot. Every time I see it more clearly. I hope it goes that way for everyone else. The Vaughan Williams tune is "simply" beautiful too. Hi there, I've been thinking about "Alleluia, Sing to Jesus*, particularly because of the 4th verse, "...alleluia, born of Mary, earth His footstool, heav'n His throne..." It ties in quite well with the Matthew 5 Gospel, and fits in with any Saturday evening Vigil Masses/Services, since the 11th is World day of the Sick and the Feast of Our Lady of Lourdes. I also thought of "A New Commandment", Love is His Word (V's 3-7", and *Guide me O Thou Great Redeemer. Although I'm still undecided and have also been considering the following; "Seek Ye First", "Open Your Ears Oh Christian People", "Be Thou My Vision", "Be Still For The Presence of the Lord", "All People That On Earth Do Dwell", and, "I Will Be With You". 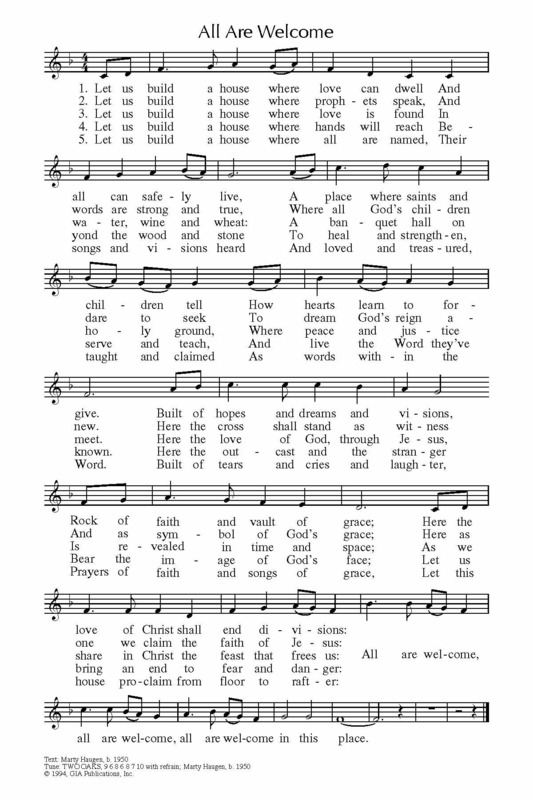 I think all of these hymns offer a good mix/choice of the traditional and modern which caters to all elements of a congregation's preferences, and you can still introduce some variety into the musical planning by using different combinations so that they can complement/emphasize the readings while being true to this week’s theme. Natalie thanks again for all you do.